Hi. I'm Victoria Hefty, and welcome to Activate Purpose where I talk about finding purpose through action while balancing motherhood and career. In today's episode, I'm going to share a lesson from "The Happiness Advantage" book that made me rethink how I viewed negative or adverse events and taught me why they're never truly as bad as we think they are. 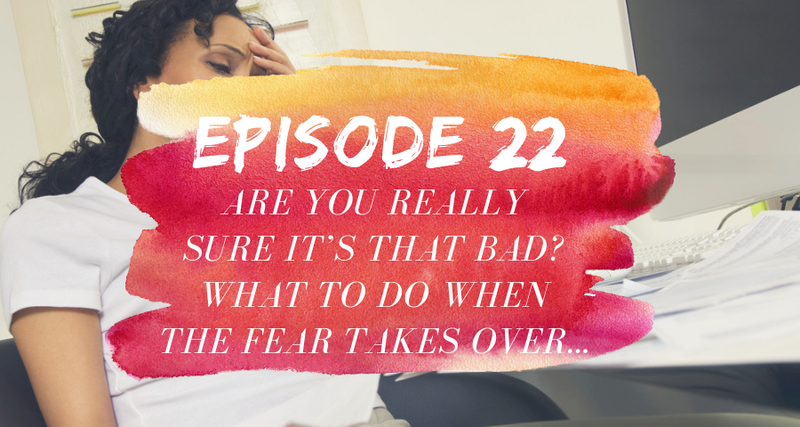 If you're struggling with not making certain decisions or doing certain things because you're constantly fearful of the outcome, this is the show for you. So, thank you for joining me today on this cloudy fall day. I'm actually recording this podcast in the evening right before our family heads to dinner at a friend's house. My husband asked if I could record this podcast while he "quietly played with our three-year-old daughter" just down the hall from me, and I think my look made it very clear that quiet play has never happened in this house. He's actually outside playing with her in the near dark while I record this. You got to love him and his support on days like this. There really is, at least in my world, no such thing as having it all, and I'm really grateful for the little moments like this that allow me to share my little piece of creativity with the world and have a little escape from everything else. Hopefully, this episode won't feel too rushed. So, let's get right in. This show is going to be sort of a continuation of last week's episode, which was episode 21 where I talked about stumbling upon this book I didn't think I needed called "The Happiness Advantage" by Shawn Achor. I finished reading it and can confidently say it's one of my favorite nonfiction/business/self-help books I've read so far. And that's actually saying a lot since I'm a pretty avid reader and those are three genres that I really like since I always like sort of growing and reading. I like this book specifically because it's short. Always a good thing, right? Filled with great research, it's very straight forward and pragmatic, and more importantly, it's forced me to rethink a couple of assumptions that I've incorrectly been relying upon, which leads to the point of today's episode. There are many insights that I could've shared with you from this book but I'm going to focus on one that I think will probably stay with me longer than the others, and then maybe I'll do a follow up and share one more next week. But for now, I'm just going to focus on this one. This has to do with when you face adversity or the prospect of adversity. Now, I feel like I shouldn't have to say this, but I will go ahead and make the disclaimer that I'm using adversity to talk about common life or job-related things that can go wrong. I don't want to flippantly talk about adversity in terms of extreme adverse events like death, acts of violence, etc. You know what I mean, so keep that in mind when we're talking about overcoming adverse events. We're not talking about overcoming something like truly tragic. These are just more of the day-to-day things that I think we view as adverse but really may not be as bad. Anyway, multiple books I've read in the past talk about how to either deal with or overcome adversity, but the author, Shawn Achor, wrote something that made me go, "Hmm. I hadn't really thought about it that way." He says that when an adverse event happens or maybe we were even anticipating that event would happen and it did, it's important to ask the question, was the event as bad as we first thought? He says, "This particular method is called 'decatastrophizing' which means taking times to show ourselves that while the adversity is real, it is perhaps not as catastrophic as we may have made it out to be. That may sound like a positive platitude stripped off of a Hallmark card, but the idea that things are never as bad as they actually seem is a fact based on our fundamental biology because thousands of years of evolution have made us so remarkably good at adapting to even the most extreme life circumstances, adversity never hits us quite as hard or for quite as long as we think it might." He then goes on to give a couple of examples and continues, so I'll start quoting again. "Simply speaking, the human psyche is so much more resilient than we even realize, which is why when faced with a terrible prospect for example, the end of a love affair or the end of a job, we overestimate how unhappy it will make us and for how long." He then goes on again to give even more examples from another researcher who has done several studies proving this theory or concept, like one study that revealed that college students overestimate how devastated they would feel at the end of a romantic relationship, or how assistant professors predicted that being denied tenure would lead to drastically lowered levels of happiness when in fact, professors denied tenure do not experience this at all." He then ends by saying, "Adversities, no matter what they are, simply don't hit us as hard as we think they will. Just knowing this quirk of human psychology that our fear of consequences is always worse than the consequence themselves can help us move toward a more optimistic interpretation of the downs we will inevitably face." When I finished reading this section, I really had to stop and think about what I had just read. I have to admit, at least so far in my life, all of my big fears in life, be it professional or even pursuing creative projects, now that I take the time to think about it, have not really materialized the way I thought they would as far as the fear aspect. For example, when I resigned from my job because I was unhappy at work and wanted more flexibility to raise my daughter, I had a very real fear that I was making a huge mistake that I would regret. Yes, I did make the decision to resign without any backup plan whatsoever which I'll talk about another day, but is very not like me let's just say. It's never happened, but I did that because I had faith that it would eventually sort of work out in my favor, but let's be clear. The immediate fear was very real. I don't even know if I would recommend that anyone do that. But at the time, I felt so strongly that I needed to do this that the justification sort of overrode the fear, but the fear was very present. I remember there were days when I would wake up, weeks and even months after, and think, "What the heck did I just do? I probably just made a mistake, like oh, my goodness, Victoria." Or I remembered as I was doing this, some other memories came up. One was when I wrote a blog post that unintentionally offended some important readers and potential clients, and I was positive that no one would read my website or work with me again, but after sending out some thoughtful emails, it ended up being like a cringeworthy event, but definitely not catastrophic, and all things eventually were fine. So, the more I thought about it, the more examples I came up with of events in my life that at the time seemed absolutely devastating, but as Shawn mentioned, were neither as bad nor lasted as long as I thought they would. The point is I think this section of the book reminded me that from now on, whether I have a real fear of something happening in the future or have to deal with something I'm currently afraid of, I need to remember that the worst case scenario, in fact, won't be nearly as bad as I think it will. So, my challenge for you today is to think of a decision that you want to make or activity that maybe you want to try but are afraid to do so. It could be that there's a fear of failure, fear of what other people may think of you, fear of not making the right decision, anything really. Ask yourself, "What is the worst case scenario?" And then ask yourself, "What if I'm actually overestimating just how bad this event is going to be, and what if I'm actually overestimating how long that feeling is going to last? Would that affect my decision on whether I take action or not? What other past experiences have had where I thought the world was going to end, but everything actually turned out okay in the end?" By doing this, you're going to force yourself to stop thinking that every decision will have catastrophic outcomes, and instead give yourself a bit more courage and grace to try something new. If you have any questions or want to share your breakthrough, you can email me at victoria@activatepurpose.com. I will include links to "The Happiness Advantage" book, as well as last week's episode in the show notes at activatepurpose.com/episode22. Finally, if you enjoyed today's episode, make sure to leave a review. I read every single one, and subscribe to receive next week's episode. Until next time. Bye!